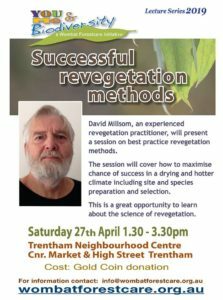 Wombat Forestcare is hosting an opportunity to learn about maximising revegetation success with David Millsom , an experienced revegetation practitioner. Drivers for and development of large scale revegetation techniques. Site preparation for tubestock and direct seeding. Species selection – what to plant and why. Provenance, origin of the term and what genetics are telling us. Seed treatments – overview of how to maximise germination, use of smoke, heat, cold and other methods. Research, development and application of live bacteria innoculant for native legumes. How to maximise chance of success in a drying and hotter climate. View article Comment on article | be the first! With the cooler weather arriving, Friends of Campbells Creek Landcare are kicking off a working bee this weekend, aimed at establishing another viable population of Goldfields Grevillea (Grevillea dryophylla). Wattle Flat Forest (west of Barkers Creek) is the only place in Mount Alexander Shire with a natural population of Goldfields Grevillea. This means it is vulnerable to wildfire and other threats. 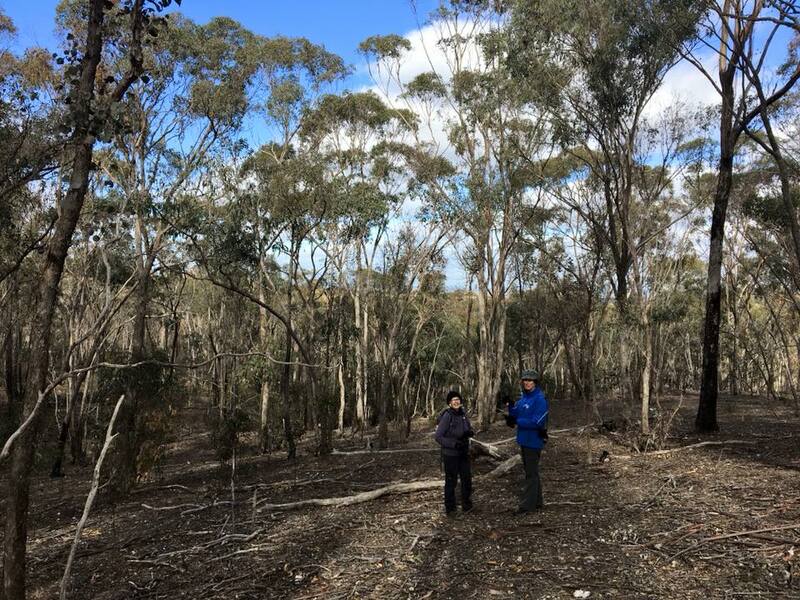 For the last five years or so, Friends of Campbells Creek Landcare have been experimenting with re-establishing this plant at Campbells Creek, near Castlemaine, Victoria. Not only have plants survived, they have set seed and recruited a second generation! This is great news. By creating another larger population at Campbells Creek, they will increase the plant’s chance of surviving in the shire and improve habitat quality along the creek, as the flowers attract honeyeaters and other nectar-feeding animals. Friends of Campbells Creek Landcare will be direct sowing the seeds of this interesting plant, plus some other wildflowers that are doing well in this area, including Leucochrysum albicans, Wahlenbergia multicaulis and Xerochrysum viscosum. Morning tea will be provided around midday. BirdLife International has identified areas of conservation importance around the world as Key Biodiversity Areas (KBAs). This includes KBAs right here in our region – the Bendigo Box Ironbark area. Our KBAs were designated especially for their importance for two special birds, Diamond Firetail and Swift Parrot, and cover both public and private land. Birdlife’s Easter health check takes an annual snapshot of the threat and conservation actions of the areas that matter most to birds. BirdLife compares results between KBAs across Australia and around the globe. The results are extremely valuable, especially for identifying species decline and targeting conservation work. For more information on the KBA and the Easter health check process click here. 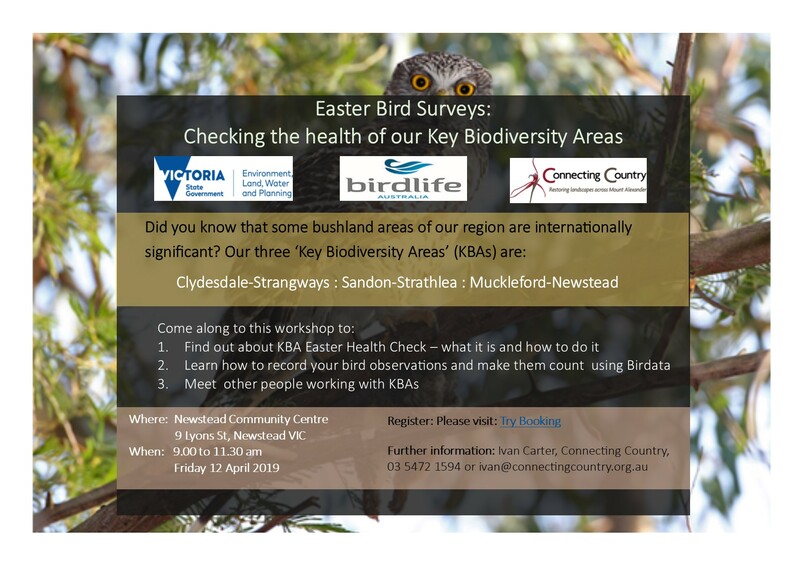 BirdLife is looking for local people to complete a 2019 Easter health check for each KBA. To assist, Connecting Country is running a workshop on Friday 12 April 2019 in Newstead. We’ve invited Greg Turner from BirdLife Victoria to take us through the process for our part of the Bendigo Box Ironbark area. Geoff Nevill from the Muckleford Forest Friends Group will also talk about his group’s work in the region. This annual check is all about assessing habitat and its threats. Anyone with an interest in landscape restoration is most welcome to come along and get involved, whether you’re a beginner or an experienced birdwatcher. Learn about the KBA’s in the Mount Alexander Shire. Find out about KBA Easter Health Check – what it is and how to do it. Meet other people working with KBAs. This is a free event, with morning tea and refreshments provided. If you have any questions, please contact Ivan Carter at Connecting Country on (03) 5472 1594 or ivan@connectingcountry.org.au. This event is supported by funding from the Victorian Department of Environment, Land, Water and Planning.